use a puller. im lucky to have a lot of tools to use. and air. anyone have info on setting the timing chain up? dot to dot? Okay another bump for this. Looking to put a motor in my 4x4 shortly. The plan is to buy a new style pan and pickup along with everything else for me to run serp. What i need to know is do I need a special 4x4 pan or will a 2wd pan work? rockauto doesn't list a separate pan for the 4x4 but i seem to think i have a slightly different cross member then a 2wd truck? When I pull my engine and swap over the timing cover, I'll snap a pic and post it for sh*ts and giggles. 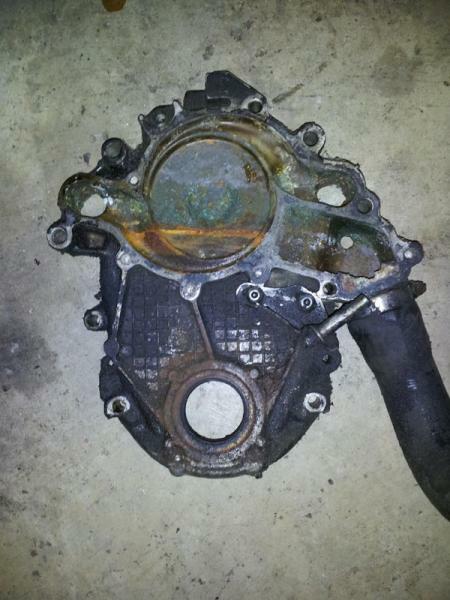 That's an old cover....That might indicate one of two things...One that isn't the original motor...or two, if it is, it proves that early 86 EFI trucks used old motors left over from 85....Is there a block off plate behind the steering pump where a fuel pump would have been located? Hey Max...is he gonna run into trouble with that cover on the 3.4? I don't think you can put the old pan on the 3.4 can you? I mean the way the rear of the pan interfaces with the crank seal? ddog800 if that is the case you're gonna need a front cover and pan too. Fortunately for you I have a crate motor cover....brand stinking new too that came with my motor. Since I put serpentine accessories like the 87 forward ones, I didn't need this one. It is for all practical purposes a regular 86 normal direction housing with the new sealer bottom....Hell man, even if you CAN use the old 2 bolt cover and pan, I wouldn't because that POS will leak eventually. That design never sealed well. Either that or convert to serp accessories like I did. I freakin love the single belt design. Especially when it comes to servicing the truck. My truck has an electric fan too, so it makes taking it on and off a very simple operation. If you did that you could use any 87+ front cover or pan which are extremely common....Even the F body one, but the issue with that is that there is no timing tab. Suppose you could add one, but I don't know how accurate you would get on it. That is definitely a newer block...right there in front should be where the pump should be if it existed....See the outline for the base? But there is no hole in the front. So unless there has been some part swapping this confirms some old covers and pans went on new motors for 86. Correct me if I am wrong, but didn't GM discontinued the ht3.4 "crate"engine? Yeah, but there are still sources for them I think if you dig. I bought mine back in 2010 assuming they would be gone before too much longer. Just now getting harder to find them. This might be a silly question, but I haven't seen it specifically addressed anywhere. Are you guys running stock clutches? I'm thinking about doing a similar swap, but I wasn't sure if the stock clutch would handle the roughly 210hp and 230lbft of torque I'm looking to make. I've got an 91 reg cab short bed 2.8 5 speed that I've done the 3.4 camaro swap with 4.3 injectors.l have about 5 thousand trouble free miles on it and I want to thank the people who posted all the great info. About 1 month ago I decided to charge up the air and get it working again. This hilighted an inherant issue with this swap. The compressor would choke out the engine when driving fast and downshifting from 3rd to second. I installed an air/fuel guage and it was going fully lean at that moment and those old pancake compressors draw a lot of power so consequently it would kill the engine. Too dangerous to drive. Has anyone on this site had a similar problem? I'm working with a company called Motorvation to get a custom fuel curve added to the prom. The first attempt cured the lean condition and the air worked fine but the mixture was way rich. The stoich meter was fully rich throughout the driving range. No good. I'm waiting on the second chip to arrive. Im just wondering ifsomeone out there has had the same problem and already knows the ultmate solution. If so you will save me a lot of trouble. Any help will be greatly appreciated. You are most welcome...glad we could help! That PDF from page 1 doesn't seem to be up any more. Anyone else have a copy? The rear main seal in my 84 is finally letting go and I'm planning to hunt down a crate 3.4. I have posted a progress thread on the start of my 3.4 swap from a camaro, but I am going to verify something here instead. I am still confused on the front cover situation even though I have read this thread a few times. Soo, If I decide to stay with the serpintine setup that came with the 94 3.4 motor, I can leave the front just the way it is but I need to install a oil pan and pickup from a 87 and up 2.8 4x4 style. And I am aware that the front cover will not have a timing tab. Is this correct ? But, if I decide to go with vbelts, from my 85 2.8, I will need to install the front cover, water pump,acessories,oil pan, and pickup. With also the thought that the front cover isnt the greatest because they are known to leak. Last, If I decide to go vbelts and not use the old front cover, what exactly do I need and from what year 4x4 set up ? I messaged you on this one...If you use Camaro accessories, use an S10 water pump unless you convert to electric. If you stay V belt, you need a 1986 front cover from an S10. Your old cover won't work. The 86 is unique in that it has the newer style seal on the bottom, and still has the V belt water pump rotation. A crate engine comes with one although a different part number it is the same part. You will need a 1985 water pump, an 86+ oil pan, 86 front cover. You cannot use your 85 cover. I'd source a 1987+ serpentine system and call it a day. The only snafu you will run into is that the outlet on the carb intake will interfere with the idler pulley bracket. A 90 degree elbow and a grinder will correct it. I have a new 86 cover from my crate I did not use. PM me if interested. I don't know if they screwed up, or just didn't care that they didn't make 1/50th of the nation's states' smog requirements. "California didn't make it...Oh well, put that stock cam back in it I guess! Those assholes in the other 49 will just have to deal" LOL. 3/4" ? thanks. This is for a 4x4 application. In my case? Better than 3.8. Better power to weight ratio. Getting about 18-19. I was getting 14-16, usually with the 4bbl and about freaking 12 with the Rochester. You guys should make this a sticky! It would eliminate a lot of redundant questions. Here is a PDF I made of the parts list and I also included the start-up instructions for the motor at the end of the document. That's piggybacked on my band's site just in case you were wondering what the heck "tricky 6" is. Just subbing this thread so I never forget. So does the 3.4 motor mount straight where the 2.8 was or do you need to get new motor mounts? Absolutely. The 3.4 is a drop in. Other than an electric fuel pump conversion and a couple other things it’s straight up drop in.